While cold weather, as a new AAA study reveals, can reduce the range of electric vehicles by roughly 40 percent, the prospect of being frozen out of its windfall from Washington kicked the industry’s lobbying team into overdrive this winter. For more than a decade, you, the American taxpayer, have been responsible for funding that windfall through a federal tax credit of up to $7,500 for every luxury electric car sold in the country. Currently capped at 200,000 units per manufacturer, electric vehicle buyers were the beneficiaries of $4.7 billion between 2011 and 2017; absent a repeal, the Joint Committee on Taxation (JCT) projects that figure to total $7.5 billion between FY2018 and FY2022 alone. 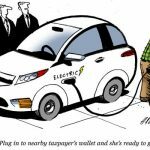 The Manhattan Institute, meanwhile, estimates that the elimination of electric car subsidies could save taxpayers $20 billion.